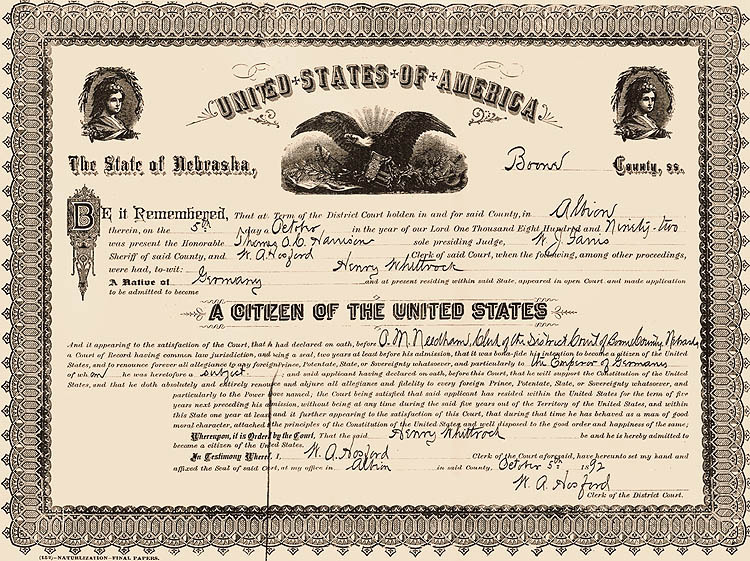 Citizenship was granted to Henry Wittrock on October 5, 1892 in Albion, Boone County, Nebraska. Albion is located 20 miles southeast of Petersburg, which is where Henry's sister, Mary Stallman, lived with her husband and family. Anna Sprenger's parents, Herman and Auguste Sprenger, also lived near Petersburg. Note that the name on the certificate is "Henry Whittrock". The incorrect spelling of the name caused a lot of confusion when Henry filed his homestead claim, which was filed in the name of "Anton Henry Wittrock".